What’s better than partying in a tropical location for Spring Break? Partying in multiple! 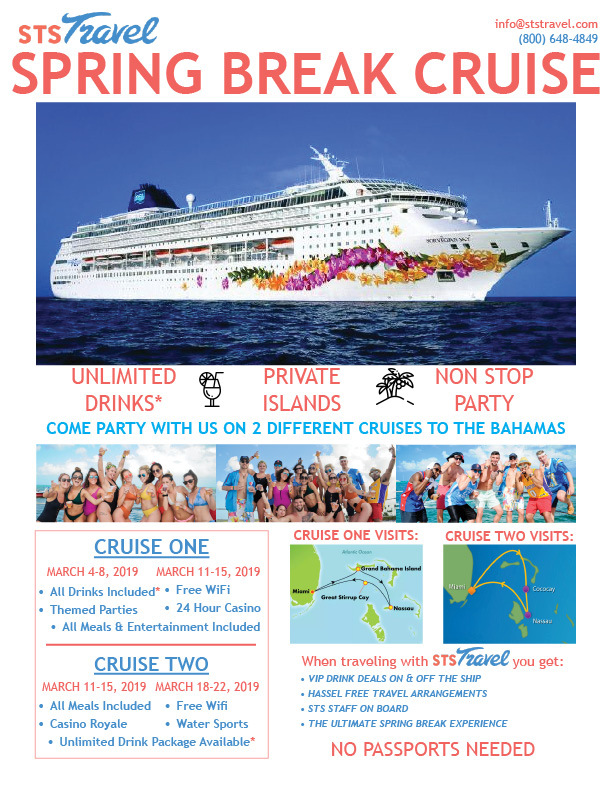 Set sail with us every week of March and island hop through the Bahamas on the ultimate Spring Break party cruise. 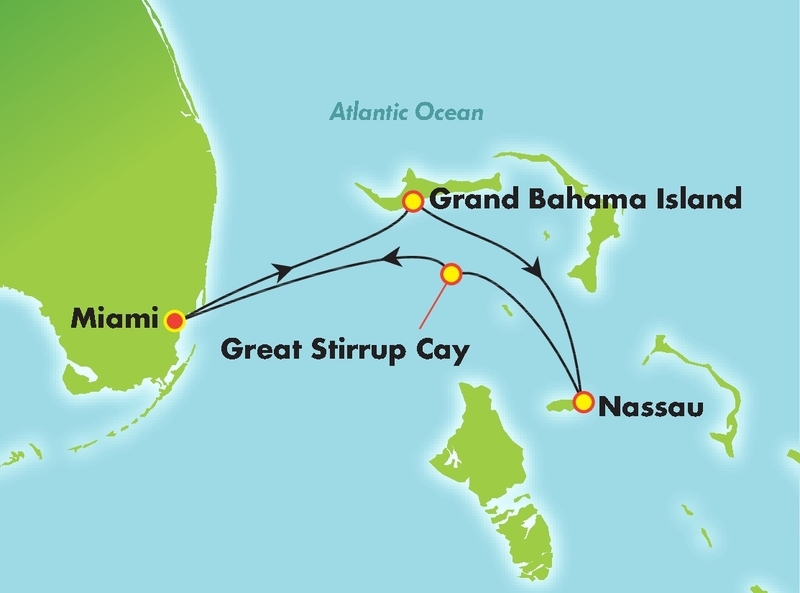 No matter what week your Spring Break falls on, STS Travel has a cruise for you! Our two cruises leave from Miami, and spend 4 nights sailing throughout the Bahamas, spending each day somewhere new. Drinks are plentiful, the food is unlimited, and the best part is these cruises are Spring Break centered, so you won’t be stuck in between families and retirees. Everyone on board will be looking to party just as much as you! Why is the Spring Break party cruise the best option for your group? With STS Travel, you will be part of the partying crew on the ship with free access to private events on and off the cruise. Upon arrival in Miami, you will be met by STS Staff who will be with you throughout the cruise. STS Travel can also assist you and your group with pre or post hotels in Miami and airfare. With STS Travel, you can leave the hassles to us and put your focus on partying and having fun. The first cruise sails the weeks of March 4th-8th, 2019 and March 11th-15th, 2019. The sky is the limit with this Spring Break Cruise! You will leave all your worries in Miami as you board this all-inclusive cruise. Everything you could ever need is just a short walk away. No need to be nervous of accidentally emptying your savings because by all inclusive, we mean it! Never worry about where your next meal or, more importantly, next drink is coming from because this cruise offers 10 dining options, 11 bars and clubs with free open bar that stay open until the last customer goes to bed! Exciting entertainment is everywhere you turn every night. As soon as you wake up you can feel the excitement. On the pool deck live music and entertainment blast daily. You can hang in either of their 2 pools or 4 hot tubs with unlimited drinks in hand. Nightlife on board is consistently ranked at the top, hosting karaoke, games, and throwing nightly themed parties. The Casino on board is available 24 hours for those who never want the party to stop. This popular 4 night cruise embarks and disembarks from Miami and makes stops at Grand Bahama Island, Nassau, and Great Stirrup Cay, Norwegian Cruise Lines own private island that has free drinks and food just like the ship! 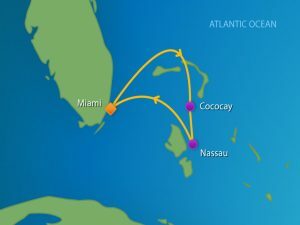 Cruise Two sails the weeks of March 11th-15th, 2019 and March 18th-22nd, 2019. Prepare to be wowed as you board this Spring Break Party Cruise. Recently renovated and ready to host you and 3,000 of your closest college friends, this ship is ready for a party. This cruise puts a unique spin on Spring Break by making you feel like you’re at a boozy water park in the middle of the ocean. Slide down water slides, try your luck on the surf simulator, or party well into the night in their 3 pools and 6 hot tubs. Refuel at any of the 10 bars where unlimited drink packages are available and grab a bite at any hour from their 6 included restaurants. This lively Spring Break cruise guarantees you’ll never be bored. A new party starts every time the sun goes down. Choose from night clubs, 70’s Discos, pool parties, and karaoke, or hop around to all. Most are still going well into the AM. You’ll visit Nassau and CocoCay, Royal Caribbean’s own private island where your meals are included and your unlimited drink package works! We would love to have you join us for the ultimate Spring Break party cruise this year!